In its quest to become a guardian for your health, Apple’s ECG equipped smartwatch is already helping save lives. The device was launched back in September and it came with a slew of upgrades. Perhaps the most talked about feature was the new ECG sensor, which was finally enabled for US residents on December 6th. It is capable of generating a pulse waveform similar to that dished out by professional single-lead electrocardiograms. This type of information lets you know whether your heart rhythm shows signs of atrial fibrillation (which indicates there is a problem), or sinus rhythm (which means it’s beating in a normal pattern). Apple has been quick to point out the ECG monitor “is intended for informational use only”. Abnormal heart rhythms are treatable, but many people don’t feel symptoms. The trick is detecting there’s a problem in time. The Cupertino outfit is hopping its Series 4 watch will be of particular use to people who are not aware they have the condition. CDC estimates there are between 2.7 and 6.1 million Americans living with the condition. Just a few days following the launch, reports show the wearable may have already helped to save at least one life. 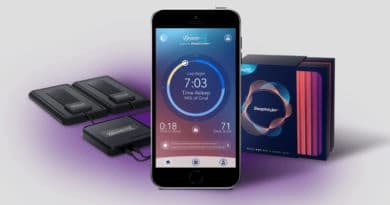 According to ABC News, when 46 year old Richmond, Virginia resident Ed Dentel enabled the feature over the weekend, the device quickly alerted him it may have spotted atrial fibrillation in his heart rhythm. “The application on the launch sounded off right away with atrial fibrillation — not something I’ve ever heard of, but since I’m in pretty decent health and never had a problem before, I didn’t give it much thought,” said Dental in an interview with ABC News. The next day he received another notification. Perplexed, he tried restarting the device but that didn’t make any difference. It kept alerting him. He then gave the watch to his wife to wear and her results came back as normal. “I thought, ‘This is silly. I’ve got meetings, I’ve got stuff to do. I don’t have time to sit here and wait,'” he adds. A few warnings later, Dentel decided to have himself checked out. He went to his doctor who eventually informed him the Apple Watch may have saved his life. Dentel was referred to a cardiologist who confirmed atrial fibrillation. Some have expressed concerns the ECG sensor on the Series 4 watch may spit out false positives and that this would create an unnecessary burden on health staff. Although its still early days, so far this doesn’t seem to be the case. Afib is the most common form of irregular heartbeat. It is characterized by rapid and irregular beating of the atria. Often it starts as brief periods of abnormal beating which can become more problematic over time. Left untreated, it can contribute to an increased risk of heart failure, dementia and stroke. If you find the watch is sending you alerts, don’t panic. Its ECG waveform is not intended to replace traditional methods of diagnosis. Rather than interpreting or taking clinical action based on the device output, make sure to seek an opinion from a qualified healthcare professional. As the story above shows, the Apple Watch can very well be used to help save lives.